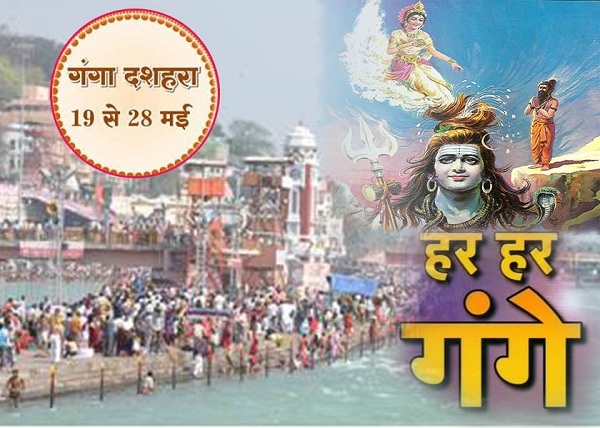 Ganga Dassehra which is also known as Ganga Dashmi is festival of celebration for the birth of River Ganga on Earth. It is also spelled as Ganga Dashahara . This festival is celebrated throughout the India but it has special significance in Hindu community of Uttar Pradesh, Bihar, Bengal where this river flows throw. The river Ganges (Ganga) holds a very important place and she is treated as Mother as well worshiped as Goddess. She is known to take away sins of human mankind if one takes bath in it. The Ganges is an heavenly river i.e. it flows through heaven, later it was brought to earth by Bhagirath. The legend behind this goes back to Rishi Agastya. Once as per legend, few demons from Ocean used to disturb hermits, then Hermits asked Rishi Agastya to help, Agastya drank all water of ocean which resulted in drought to for whole man kind, later on Bhagirath, to wash away sins of his ancestors by the water of river Ganga, prayed Lord Brahma to bring down river to earth. Brahma agreed and asked him to pray Vishnu to allow River to flow from his Big Toe, but Vishnu in turn asked Lord Shiva to take the torrential fall of the River to save the earth from direct impact of the power of River Ganga, Lord Shiva agreed and hence it is shown that river Ganga flows from hair of Lord Shiva. Hence, Bhagirath was able to brought Ganges to Earth thus ending the the drought on earth, this is the reason it is also known Bhagirathi. Essentially, Ganga Dashmi is a festival of celebrating birth of River Ganga, people take bath in river to wash off their SINs. The river Ganga is worshiped. In some part, it is also known as Kite Dassehra and people celebrate it by flying the kites throughout. Though there is no apparent reason or ritual of kite flying but It is observed just as part of celebration.